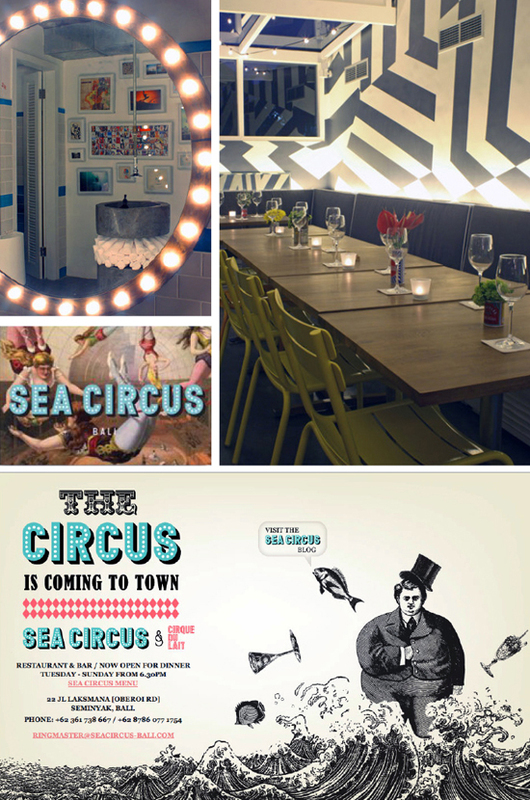 Love the name, graphics, brand dialog and look that is Sea Circus; a new restaurant in Seminyak. Melbourne-based designer, Georgina O'Connor, is the interiors ringmaster who has collaborated with French-born, Bali local Charles Pelletier. Graphic designer, Nick Cox has jumped through hoops to create a playful identity. According to Georgina they serve fab fish and chips to the nearby beach (collect a helium balloon, that serves as a table number, so they know where to deliver them - how much fun is that!). Stuart Marsden (ex Cecconi's, Melbourne) is in charge of the menu. If you're in Bali then owners, Josh Herdman & Charlotte Hunton, will give you front row seats if you mention the POD. Sea Circus, 22 Jl. Laksmana [Oberoi rd] 22 Jl. Laksmana [Oberoi rd], Seminyak, Bali.